The update slips in the second version of Knox and replaces ISIS Wallet with its new name, Softcard. It also adds "Apply" and "Cancel" buttons to the Home Screen Mode. Taken together, these may be the most visual changes. The version number is KOT49H.I545VRUFNG6. Carriers tend not to roll out over-the-air updates all at once, so sit tight if it doesn't arrive right away. 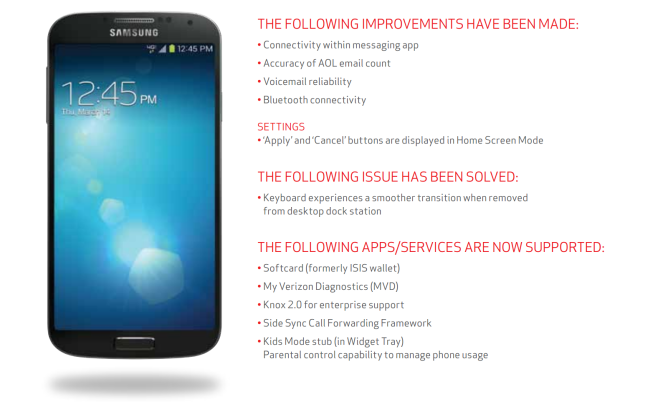 Hit the source link below to peruse Verizon's support PDF in the meantime.